April 27, 2015 Baking, Pastry & Culinary Arts, Business & Hospitality, Corporate Relations, Events, Scholarships, Students Comments are disabled after 182 days. Darren J. Layre, of Hatboro, prepares IPA braised lamb, parsnip and turnip pierogis from his “Taste the Season: Spring” menu (developed and prepared with event partner Patrick J. Kelly, of Muncy). A blue-ribbon restaurant dessert: deconstructed apple-walnut tart with maple custard, presented by Marissa R. Dimoff, of Mount Union. A cake by Dylan H. Therrien, of Reading, receives honorable mention. Brianna R. Helmick, of Hershey, and Rachel A. Mertz, of Paxinos, stand ready to offer insight into their dishes: smoked duck with red beet mashed potatoes, and light-chocolate red beet sponge cake. A cake by Daryan M. Ficks, of New Columbia, receives third-place honors. Outdoor lovers all: event partners Victoria L. Zablocky, of Jersey Shore; Elizabeth M. Ball, of Phoenixville; and Brianna E. Bucklin, of Whitehall; serve up a fishing-and-camping themed menu. Judges award “Best of Show” honors to Breanna N. Abbey, of Carlisle, for a Marine Corps graduation cake. Bradley M. Moriarty, of Clarence, and Jenna E. Haas, of Lancaster, dish samples of “speakeasy roasted clams with fettuccini” from their Roaring Twenties: Bonnie and Clyde-themed display. A graduation cake for young bookworms earns second place for Sarah A. Brunski, of Mount Holly Springs. Students in the Cakes and Decorations course skillfully fill a table with graduation-themed cakes. Alexander R. Campolongo, of State College, adds samples of chocolate sponge cake to the table of “The Bean Grinders,” staffed by Campolongo and Kyle H. Abel, of Nazareth. 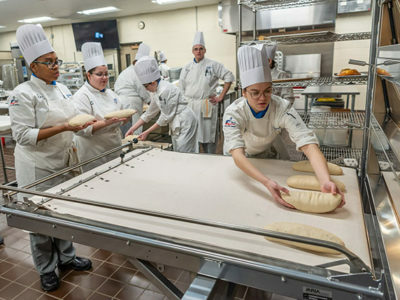 A tantalizing display of advanced bread-shaping by students in the Advanced Patisserie Operations class beckons carb lovers. A bite-sized sample of fried trout stuffed with smoked-trout mousse. Light-chocolate red beet sponge cake topped with red beet crisps. Ashley R. Post, of Orwigsburg, explains to judge Christopher R. Grove, a Penn College dining services manager, why she and Zachary A. Mausteller, of Danville, chose a German menu. A chocolate sculpture by Jenna Zaremba, of Pottsville, garners first place. A chocolate centerpiece by Marissa R. Dimoff, of Mount Union, receives honorable mention. Jessica N. Felton’s chocolate windmill and garden earn second place from judges. Felton is from State College. A floral sculpture by Dylan H. Therrien, of Reading, takes third place. An edible centerpiece recreates one of the icons of the Paris Hotel in Las Vegas. Vegas’ iconic neon signs inspire a sugar centerpiece by Marci L. Cohen, of Clarks Summit. Bite-sized petit-fours play out the fun theme. Another “sign” of the Paris Hotel: A translucent sugar Eiffel Tower. An attractive line-up of desserts awaits scholarship donors and recipients. More Vegas icons, presented in edible fashion by Alivia L. Bollock, of Gaines. A headdress worthy of a Vegas stage, by Shayna L. Zerby, of Lock Haven. One of two impressive cakes – a whole-class project – graces the buffet table. The 17 students responsible for the bounty of sweet treats and beautiful tablescapes. It wouldn’t be Vegas without a chapel and an Elvis impersonator. Macaroons masquerade as a beefy treat from a famous Vegas restaurant. Feathers and masks adorn an intricate sugar centerpiece by Rachel C. Cooper, of Bangor. Pat Kaczmarek, of the Duboistown Garden Club, takes a photo with Samuel G. Bubb, a landscape/horticulture technology: landscape emphasis major from Williamsport, who received the club’s scholarship for 2014-15. Chips and dice, artifacts of Las Vegas most-renowned pastime, by Autumn E. MacInnis, of Trout Run. David T. Chavey, an automotive technology student from Hershey and the recipient of the Zachary C. Teter Memorial Automotive Scholarship, speaks with donor Brian Murray. More Las Vegas neon by Marci L. Cohen, of Clarks Summit. Tray upon tray of intricately presented desserts awaits the Sunday afternoon crowd. President Davie Jane Gilmour introduces student representative Julie H. Carr (right), recipient of the Student Leader Legacy Scholarship.